Dr. Vinita Metgudmath completed her MBBS in 1999 and Master’s Degree in ENT in 2008 from Rajiv Gandhi University of Health Sciences with a GOLD MEDAL. She has done Fellowship in Micro ear surgery from the prestigious Causse Ear Clinic, Beziers, France. She worked in Jawaharlal Nehru Medical College, Belgaum as an Associate Professor of ENT and consultant Otolaryngologist in Dr. Prabhakar Kore Hospital and MRC, Belgaum which is 2200 bedded multispecialty tertiary care hospital where she attended outpatient clinics, performed various ENT surgeries. She has many international and national publications to her credit and has participated in various international, national, zonal and state level workshops to train herself in the field of ENT. Dr. Vinita has vast clinical expertise in the management of tonsillitis, adenoiditis, sinusitis, ear and nasal bleeding and upper respiratory allergies, management of hearing loss, ear discharge, foreign bodies in ear nose and throat, management of headache, vertigo and balance disorders, snoring and sleep apnea, endoscopic evaluation of ear nose throat problems and pre-employment hearing evaluation. 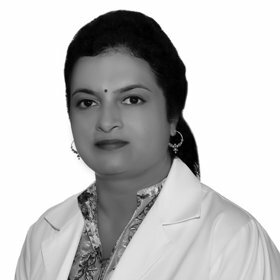 Dr. Vinita also has a surgical expertise in Ear Surgeries like Grommet insertion, Tympanoplasty, Mastoidectomy, Stapedectomy, Canaloplasty, Preauricular sinus surgery, Nose surgeries like Endoscopic Sinus Surgery, Septoplasty, Submucosal Resection, Turbinoplasty, Rhinoplasty, Throat Surgeries like Adenotonsillectomy, Micro laryngeal surgery, Thyroid surgery, Submandibular gland surgery and Thyroglossal cyst surgery. She has special interest in Microscopic Ear Surgery and Endoscopic Sinus Surgery. She is academically oriented and shows great empathy towards her patients in the diagnosis and management of common ear, nose and throat conditions in children and as well as adults and in educating patients on lifestyle modifications and their advantages in various disorders affecting Ear, Nose and Throat.